Director of Compliance at the Ministry of Natural Resources, Derrick Lawrence. The Ministry of Natural Resources on Monday said it was disappointed with what seems to be a “reneging” by all parties concerned on the terms and understanding of the mediation process on mining in the Marudi mountain area, Region Nine (Upper Takatu-Upper Essequibo) which came into being in 2016. 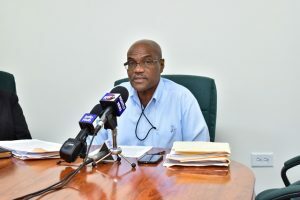 The Ministry’s Director of Compliance, Derrick Lawrence, speaking on the issue, said the ministry met last week with the parties – the Romanex Mining Company, Rupununi Miners Association and eight South Rupununi Indigenous communities – but was disappointed with what seems to be “new positions coming from the parties who appear not to want to act in good faith”. According to him, the ministry believes that Romanex can do more to accommodate the small miners and that the Rupununi Miners Association should abide with the mediated agreement and take up lands set aside for them as agreed. He added that the company believes that the South Rupununi Indigenous communities should not present any new positions after the agreement was inked; such as their new position that there should be no mining conducted in the area. “It appears that persons are attempting to derail the mediation agreement to which all parties had committed, had endorsed, and celebrated. This deviation seems driven by knowledge of the number of resources in the area,” Lawrence was quoted by government’s Department of Public Information as saying. He said the ministry has assured that there are enough resources in the area to provide for all the parties engaged if good sense prevails. Lawrence said the ministry still believes that mediation is the best way forward in resolving the issue. The concern raised by the ministry today comes months after it was forced to call on miners to respect the Marudi agreement. Back in April 2016, the Government of Guyana through Minister of Natural Resources, Raphael Trotman, intervened in a standoff between small miners from the Marudi Mountain area, representatives of Indigenous communities and Romanex Guyana Exploration Limited and facilitated a historic mediation process with the help of Major-General (Rtd.) Joseph Singh. The successful mediation resulted in all parties signing the ‘Mediation of the Marudi Mountain Dispute Agreement’ that would guide future engagements to finalise a solution.